Had them come out and give me an estimate . They were very knowledgeable and gave me a reasonable estimate. After getting other estimates some cheaper some more expensive I decided to use orange park drywall I am glad I did . The job was top notch . Would highly recommend them. Thanks for your work!!! Enjoyed working with you! Needed my popcorn ceilings removed and knock down applied. Left a message and was contacted within the hour. I have crazy hours and im only available on Sundays. The owner went out of his way to make me a Sunday appointment. Guy's were professional and clean. Thanks OPD. I am very impress with the knowledge and expertise of Greg Holloway he's from Orange Park drywall he came in and gave me an estimate and I'm very impressed with him and the company he works for definitely recommend them and and Greg. Thanks for doing an awesome job! Look forward to working with you again. I had Orange Park Drywall come out and remove my popcorn ceilings and do several repairs. The price I was given was very reasonable and the work was done in one day! The team were really nice and very respectful. I am more than satisfied with the work that was done. 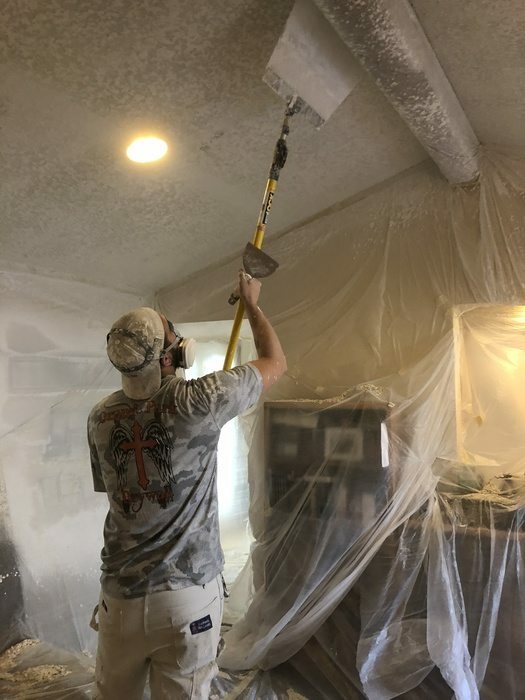 I originally had Greg remove the popcorn ceilings in the dining room , kitchen and guest bath. Replaced them with texture (also did walls in bath). It wasn't long before I had him back to finish off the rest of the house. Completed in less than one day, Greg's team was efficient and friendly. After they left, the only evidence that they had been there were the new ceilings. Our only regret is that we hadn't done this sooner.